Fitbit Charge HR Wireless Activity Wristband Review – Great info. No doubt you are somewhat aware of the Fitbit but if you are looking for one of their devices that a lot of people seem to be relying on and are getting good results with, then you will want to take a look at the Fitbit Charge HR Wireless Activity Wristband. The Fitbit Charge HR Wireless Activity Wristband is a work-out watch designed to track and monitor your progress during workouts. The claim by Fitbit HR is that by tracking things like heart-rate and calorie burn you are able to make the maximum gains by having the information available in order to make sure that you are reaching the goals that you have set. The hype behind the Fitbit Charge HR Wireless Activity Wristband is essentially the same as above. If you know and understand exactly how many calories you are burning and where your heart rate is at any given time, during exercise or when resting then you will be able to maximize your gains by having the pertinent information available right on your wrist. The cost for the Fitbit HR is $168.98 on Amazon.com. While this price seems high when you compare with others in this category it is reasonable especially with the added features included in this unit. The commitment for the Fitbit Charge HR Wireless Activity Wristband is pretty minimal. You simply strap it on and away you go. When you are not interested in the information or need to wear something more fashionable for an evening it simply goes in the jewellery box or on top of the dresser for when you need it next. The Fitbit Charge HR Wireless Activity Wristband is a great device for those who are serious about keeping track of their work out gains and for those even marginally interested in trying to get or stay healthy. By being able to keep track of not just your heart rate, resting or when working out, but other important information like calorie burn you can maximize and monitor progress. The Fitbit also tracks other key information like the amount of steps or distance travelled, stairs climbed as well as real time statistics like time and pace required to stay on track when working out. The Fitbit HR also enables you to sync in real time with your computer and to over 100 different smartphone types. It also has a monitor to track how well and how long you have slept which is a very important mechanism for a healthy and happy life. We are going to give this product a Thumbs Up rating. 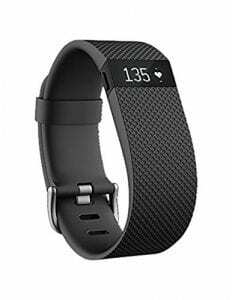 With all of the features included in Fitbit Charge HR Wireless Activity Wristband that are explained above as well as the ability to see who is calling on your smartphone with included Caller I.D feature you will be able to fully maximize your work out plans and track all your gains. The stylish and comfortable design allows the wearer to wear it pretty much whenever they choose and wherever they choose without feeling like they are wearing a bulky work out watch like previous incarnations. It is slim and sleek and lets you track a variety of important information enabling you to fully maximize your health gains and goals. For anyone serious about keeping track of their gains during a workout or anyone who wants to monitor their heart rate for other health reasons the Fitbit Charge HR Wireless Activity Wristband is an excellent unit that performs that function with a great variety of other available information contained in a very sleek and stylish design.You might also be interested in the Fitbit – bodybugg debate. What do you think? Does the Fitbit Charge HR Wireless Activity Wristband work or not? Does TRX Suspension Training Really Work?